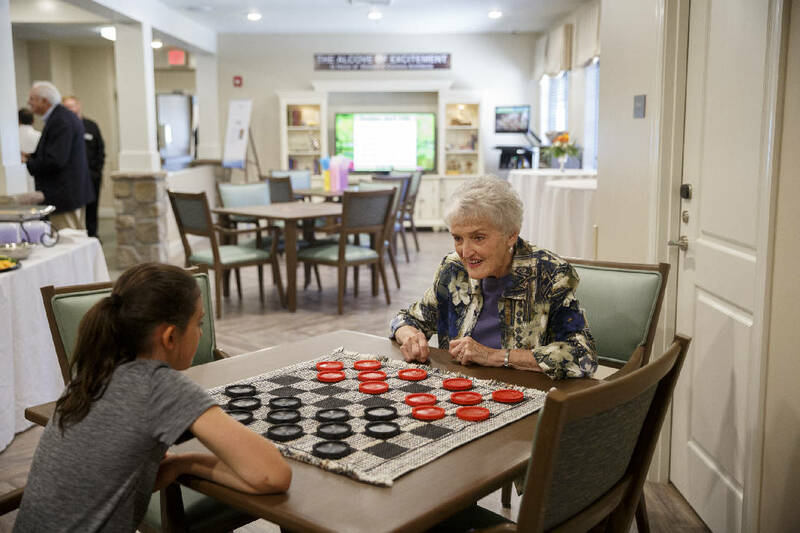 Betty Fox, right, plays checkers with her granddaughter Julia Kaufman at the opening of the Thrive at Brow Wood assisted senior living center Tuesday, April 12, 2016, in Lookout Mountain, Ga.
› Learn more about Thrive Assisted Living and Memory Care at Brow Wood at www.thriveatbrowwood.com, or call 706-956-5898. › Learn more about Brow Wood at www.browwood.com, or call 423-504-6431. › Brow Wood is at 199 Brow Wood Lane, Lookout Mountain, Ga., 30750. › Thrive at Brow Wood is at 37 Brock Drive, Lookout Mountain, Ga., 30750. This time around, there was a different sense of relief in Frank Brock's tone — something about it more relaxed than back in October 2014, when he stood just on the other side of Scenic Highway here on high Lookout Mountain to announce the development of the 48-unit, $12 million Thrive Assisted Living and Memory Care at Brow Wood. At the ceremonial ribbon-cutting for Thrive at Brow Wood on Tuesday, Brock finally saw nine years of work coming to complete fruition. Going back to 2007, his dream was to see an assisted, active senior living facility open on Lookout Mountain, his home. "What was sort of a nail-biter," he said, "was this was sort of the lynchpin." There were plenty of hurdles, false starts and even fumbles along the way, including failed development of the never-to-be Chapelbrow project closer to the town of Lookout Mountain, Ga., than the 160-acre site in Dade County for the new Brow Wood development. The Great Recession and the collapse of the housing market it brought delayed again the fulfilment of Brock's dream. Even with the single-family home development at Brow Wood taking shape across Scenic Highway from the new assisted living facility, Brock couldn't rest: the success of the master plan hinged on this, the Thrive facility. "Otherwise, we were just another development," said Brock. But he and a host of others persevered, and followed the road they felt lay before them. They got help along the way from some of the city's most prominent families, like the Whelands and Maclellans. There were gifts of land, and investment capital and effort in the name of at last opening the doors of an assisted living facility on Lookout Mountain for the first time. Tuesday afternoon, Brock stood in a sunny courtyard at Thrive at Brow Wood, an excited crowd throwing down hors d'oeuvres and remarking on things like the exposed timber of the building's interior. There was no giving up, he said. "With this thing, once you pulled the trigger, you had to get going," Brock said. "You couldn't stop." Thrive at Brow Wood is outside the oridinary for Thrive Senior Living, the Atlanta-based senior living company which will operate the facility and have majority ownership. Lookout Mountain is a small market, and Thrive at Brow Wood is smaller than Thrive's 22 other facilities, which are spread across the Southeast from Texas to Washington, D.C.
"This is the smallest community in our portfolio, but it's super unique," said Jeramy Ragsdale, founder of Thrive Senior Living. "We love the story here because it's driven by people. It's driven by Frank Brock." Ragsdale said Thrive at Brow Wood took longer than anticipated to build, and the facility is still waiting on the State of Georgia to finish its licensing, though state officials will visit the facility next week and he believes residents will be ready to move in immediately after. The facility employs 35 people, most of them full-time, and right now, Ragsdale said the facility is ahead of its pre-lease projections and has residents lined up to move in. "The wait has been more than worth it," he said. The ultimate goal of Thrive at Brow Wood is that it remains an active senior living community, which incorporates its surroundings — like Covenant College where Brock served as president for 16 years — and becomes an easy transition for folks living in the Brow Wood community across the street. There are also small independent living cottages at the Thrive site. Four exist now, and more are to come, said Ragsdale. For existing Brow Wood residents like Ray and Betty Fox, the master community allowed them to move closer to their daughter and granddaughter, and will eventually make for an easy transition into assisted living. "I plan on living to be 100," said Ray on Tuesday, "but if I fail in that, I have a place to go." Betty Fox played the couple's granddaugher, Julia Kaufman, at checkers. "We wanted to be here because we will eventually have to be here," said Betty, who also said she "taught school for 100 years," and that she adores the sunsets from her Brow Wood home. There are still brow view lots available at Brow Wood, and rooms available at Thrive across the street. Which is good, because Brock may wind up moving in someday himself. "Sure, there's a chance we'll move over here," he said. Considering the overall direction and drive of the Brow Wood project, Brock touched on several issues, including the dilemma of losing a spouse to age. Of simply growing older yourself. Of losing your hearing. Of facing the choice to leave your home and move into a senior living facility — and, as you age, of losing control. "The whole concept was people should be able to make their own choices," he said. So this was his dream finally fulfilled. But his legacy? "I don't know. I don't really know about that," he said. "I'm not in the legacy business."